Are you starting your own practice? Or maybe you’re thinking about starting one? Either way, just as with any new career or job, there will be a learning curve. Sometimes that learning curve is smooth and easy; other times, it’s steep, jagged, and drawn out. But that’s ok because some learning is to be expected when tackling something new. 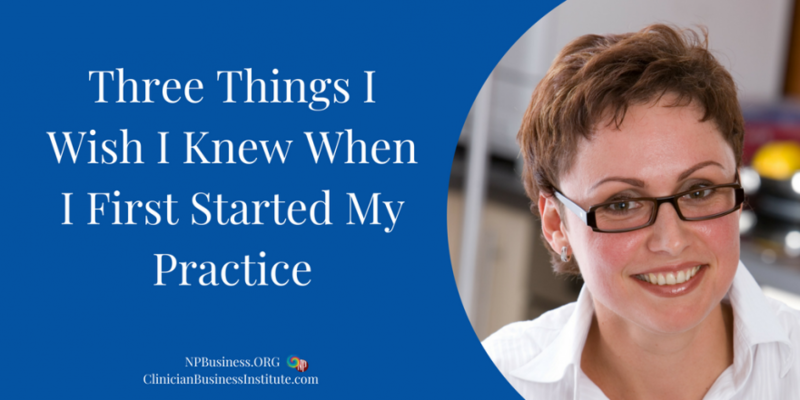 Back when I got started in my own practice, I knew there were some things I didn’t know. After all, my education was clinical and didn’t include anything about business. Is it the best or most efficient way to learn? Hardly! Looking back, there are three things, in particular, I wish I would have known before starting my practice. Had I known what I know today, I could have saved myself a lot of time, money, and many sleepless nights. #1 They Forgot To Tell Me! I thought I knew a fair amount about billing and how insurance worked. But come to find out, my knowledge was more like a scratch on the surface. I was truly surprised how much there was to understand about insurance verification, billing, follow up, accounts receivables, and practice finances. And soon it became clear that I needed to pay attention if I was to keep my doors open. As you know, if there is incomplete or no billing, that means there is no cash flow, and no money coming in. Since the first billing company I hired didn’t work out (… an understatement!) I quickly had to learn how to do it myself if I was to get paid. After my cash flow had stabilized again, I looked once more to outsource my billing. But this time I knew that I had to keep an eye on what and how things got billed. The last thing I wanted was to go through another disaster. If you accept insurance, you must educate yourself about the process. If you outsource your billing, pay attention. All too many providers think that once everything is handled by the billing company or someone in the office, that’s the end of their involvement. No, you must keep track of what has and has not be done. After all, it’s your money! Remember, it’s your responsibility. Get the billing company to run and send reports to you; do the same if you do your billing in-house. Get the reports on a regular schedule; it will allow you to identify trends. Because there is no benefit from looking at reports every “blue moon;” there’s no baseline and nothing to compare against. You must know what the numbers mean and what steps to take if they are off. #2 The Buck Stops Here! Over the years I’ve hired many employees and worked with many different vendors. For the most part, things moved along as expected. But there have been instances when both employees and vendors did not perform according to contract. It was in my early days of practice. I was on my way back to the exam room when I saw my MA nearly falling from the swivel chair she was standing on to get something from the top of a cabinet. While I had posted all required labor law posters, including one about worker health and safety, we didn’t have a formal meeting discussing safety while working at the clinic. While you may not have done anything wrong, someone working for you may do something you could get blamed for. You must first understand your level of responsibility, but that alone is not enough. You must also take steps to proof you have done everything possible to avoid adverse outcomes. That means you must assess your risk and take steps to be proactive. #3 You Can’t Do It All! This is a lesson I wish I would have learned a long time ago. And I know, I am not the only one dealing with this. It’s the belief and attitude that we can get it all done; sometimes a lot better and faster than someone else. While true at times, this thinking is counter-productive and bound to wear you out. After all, there is only one of you. And what you can get accomplished in a single day is limited! Granted, there are some things only you can do. However, there are many things an adequately trained employee can do for you. And yes, it will take time, effort, and sometimes money to train someone. How much more could you get done with what you do best and only you can do, instead of doing what others could do for you? Learn to delegate. Ask yourself what it is you enjoy and are good at doing? And then do more of that. If possible, train someone else to do the things that don’t have to be completed by you. But then, step aside and let them do the work. What are some of the things you wish you had known before starting your practice? Share your experiences with us by leaving your comment below. How about doctors and advanced practitioners team up and create networks that patients pay directly and cut out the middleman? How about these networks providing a way for healthcare providers to afford insurance and healthcare for themselves and their families?